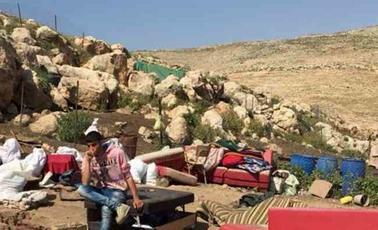 BETHLEHEM (Ma’an) — Multiple demolitions in the occupied West Bank left 124 Palestinians homeless in a single day, 60 of them children, the United Nations Office for the Coordination of Humanitarian Affairs (UNOCHA) said in a statement Friday. A total of 54 structures — including 18 donor-funded structures — were demolished on Thursday in nine different communities located in Area C, the over 60 percent of the West Bank under full Israeli military control. Khirbet Tana lies in an Israeli-declared military training zone, known as a “firing zone,” which rights groups say Israel intends to fully annex. The E1 settlement plan aims to divide the West Bank through the expansion of the illegal Israeli settlement Maale Adummim, making the creation of a contiguous Palestinian state – as envisaged by the internationally backed two-state solution to the Palestinian-Israeli conflict – almost impossible. A further 293 people, including 98 children, were otherwise affected by Thursday’s demolition campaign, UNOCHA added.